Because I am now officially a tree hugger. See, we got a notice in the mail. From the City Forester. I suppose there’s some precedent for my response. 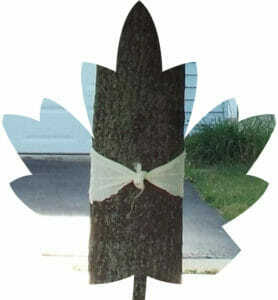 When I was young, I cried for a full afternoon the day they cut down the tree in my backyard. We were adding on to our house, and since they didn’t like my idea of letting the tree grow in the middle of our dining room, (wouldn’t that have made for an interesting centerpiece??) down it went. I think it was the first–and last–tree I ever climbed. And it was base for countless games of tag. We had other trees, but none that held so many memories. So while I was later glad for the extra space in the new part of the house, that day they yelled timber still saddens me. Maybe that’s why I hugged so hard this time. We don’t have that many trees around our house now. Each one we have, we planted. Or at least we were there when they planted it. And since 17 years ago we had our house built in a new subdivision, I remember how many years we had to wait for the birds to even find our trees. So, needless to say, I like my trees! My kids do, too. I remember for years before ours were higher than Nehemiah (Get it? “Knee-high-miah”?) or even Job’s Bildad (you know, the “Shoe-height”–Okay, I’ll stop), the kids envied relatives because they had trees to climb and could make leaf piles 6 or 7 feet tall… Meanwhile, we blew our leaves with a hair dryer. So now that our trees are finally looking like trees and not saplings, I don’t want to loose them! Okay, I get it! That Emerald Ash Borer is a pain! Countless numbers of Ash trees have been destroyed because of it. Such an elegant tree with its dainty leaves in the summer, and, in the winter, each willowy branch iced over in glistening snow. But now, all over the city, you can see the signs of the horrible pests, with poor Ash skeletons reaching naked to the sky or just sad stumps left behind. 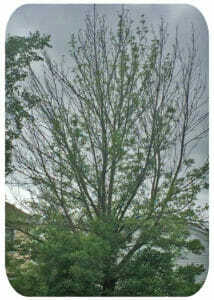 And it’s difficult to even dispose of the dead Ash in such a way that you don’t spread the pests further. So why am I so upset? Because my tree is NOT an ASH! 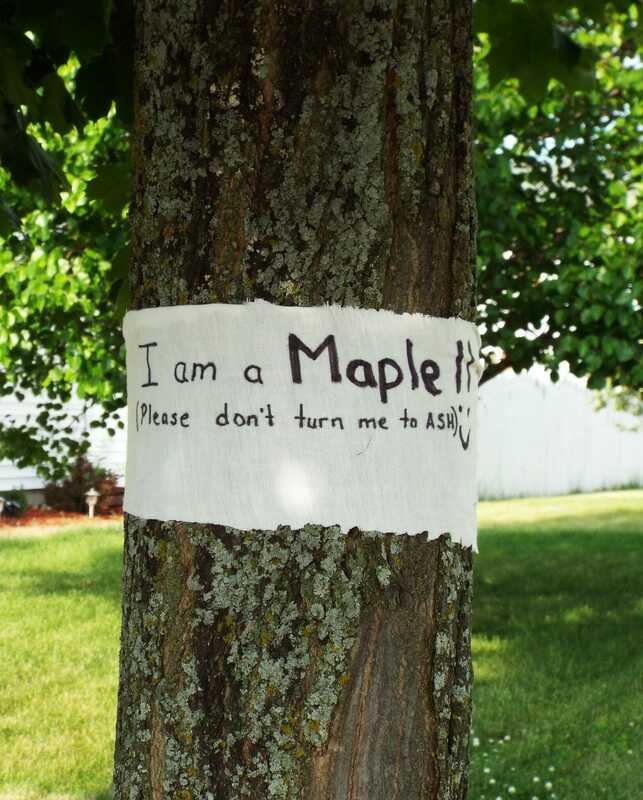 It’s a Maple! 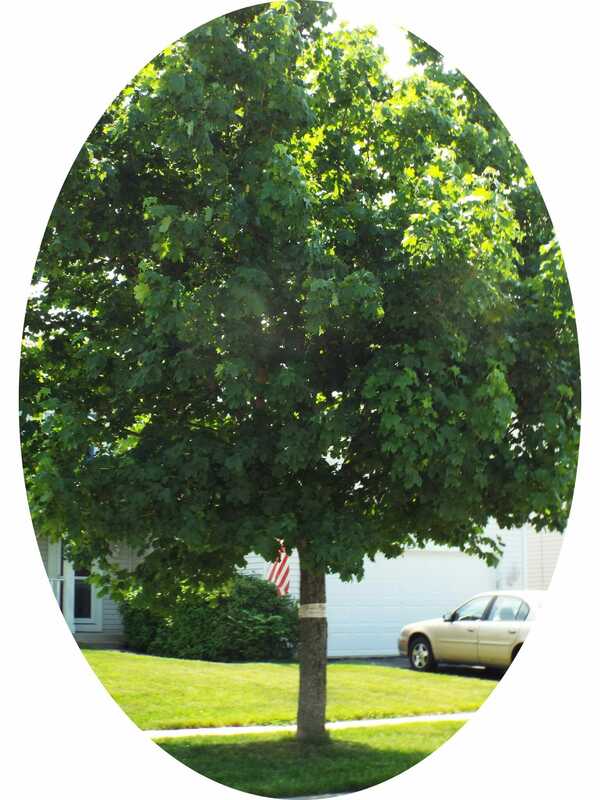 A beautiful, thriving, golden Maple. Not sure how they misidentified it. They like throwing babies out with bathwater? Maybe they rushed to conclusions? They think its okay to destroy the good with the bad? Why take the time to really figure out what the issues are in a problem? In a program? In a relationship? Just throw it away, move on, start over…. Ignore the fact that you’re leaving a scarred landscape in your wake. No, I’m NOT suggesting you ignore the bad. That needs to be addressed. Worked through. Carefully identified and doctored. If ignored, it WILL fester. But when you have a headache, it doesn’t do you any good to chop off your head! Instead of jumping to what’s easiest, let’s fight to look for and save the good while gently working through the bad! I called the city and asked to speak to whomever was planning to cut down my tree. And begged them not to. Because it’s not an Ash. It’s a Maple! They transferred my call to the City Forester’s Department, and I promptly got cut off. So I called back and re-explained. And they said the City Forester was going to come back out to my house and re-evaluate the tree. 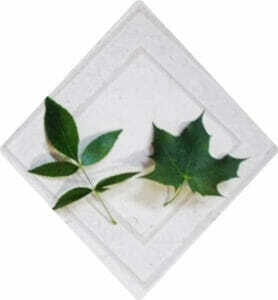 But if the City Forester determined that a Maple was an Ash the first time, what hope did I have? So I took matters into my own hands. I took a piece of cloth. And I took a magic marker. And I wrote on that cloth. And I tied that cloth around that tree in a firm but loving hug. Sometimes you just have to do it yourself! This entry was posted in scattered kernels and tagged 1 Thessalonians 5:21, don't throw the baby out with the bathwater, don't throw the good out with the bad, Don't turn me to Ash, Emerald Ash Borer, Maple Tree, Sometimes you just have to do it yourself, Tree Hugger. Elizabeth, This was much needed in my heart right now. I love how you connect everyday life occurrences to our spiritual lives. It makes things so clear! Thank you for your faithfulness. Ahh, Kate. Your words bring a balm to my heart as well. It’s so encouraging to know the Lord is using lessons He teaches me to help others…and to know that He is doing it at just the right time! Thanks for letting me know!! !